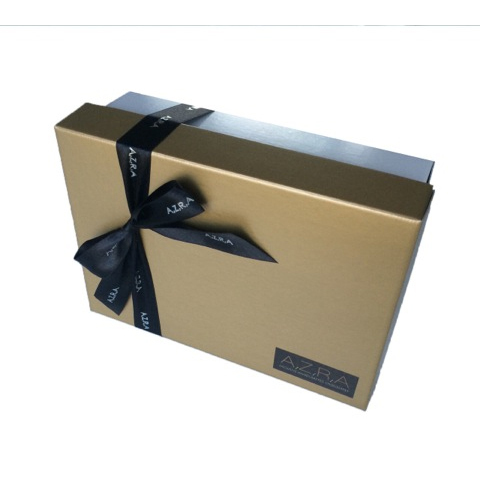 Designed to look like a shoe straight off the Louboutin range, this chocolate footwear is available in both milk and dark Belgian chocolate and is beautifully gift wrapped in a gold lid box complete with ribbon, ready to give to any lady who deserves a luxury gift. The shoes are made from fine, delicious Belgian chocolate. Handcrafted to create a leather effect and brushed with edible shimmering gold luster dust and lined with a pink strawberry flavoured interior. A must have for every fashionista! Choose to add a matching purse to your order and gift your recipient the ultimate fashionista chocolate combo! 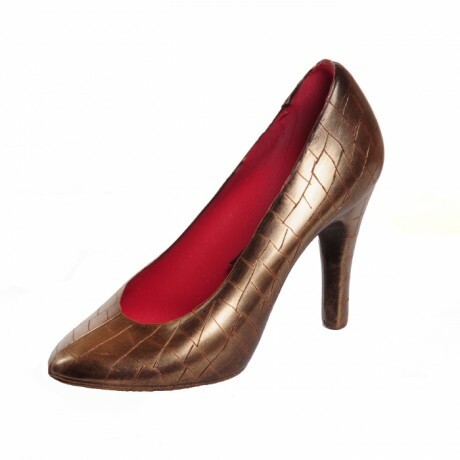 Dimensions: Shoes measure 7 inches long and stand 5 inches high, whilst the solid chocolate purse measures 10cm long and 8cm wide. Milk chocolate min cocoa solids 33.6%,min milk solids 20.8% Sugar, cocoa butter, whole (MILK) powder, emulsifier, (SOYA) lecithin, natural vanilla and strawberry flavouring. EDIBLE LUSTRE DUST: E555 Potassium Aluminium Silicate, E171 titanium dioxide, E172 iron oxide.